The image below is of the Arran ferry Caledonian Isles arriving at Ardrossan. It costs about £7 per person for a day return on the ferry, and about £30 per return for a car, so many people park in the large car park next to the pier for a few pounds per day, rather than take the car. If you are taking a car at weekends or in the school holiday season, it is best to pre-book, as the ferry can be fully booked then. We were being given a tour round the south side of the Island by relations, to the Glenashdale Falls at Whiting Bay, the Torrylin Cairn at Kilmory on the southwest side of the Island, and to Blackwaterfoot for the beach, so took the car. The image below is from the ferry car park right next to the pier, it only costs between 2 and 3 pounds per day to park here. Ardrossan Train Station is situated less than half of a mile south of the ferry terminal. You can normally buy train/ferry tickets together with a discount. Train/Ferry Map. The image below is of one of the restaurants on board the ferry. The crossing takes about 1 hour to Brodick, so we had plenty of time for breakfast. The image below is from the ferry when approaching Brodick. There should be buses waiting at the Brodick Ferry Terminal for the all the larger ferry crossings if you do not take the car. Note, there are no buses that run to suit the first early ferry though? The bus stops are right next to the ferry terminal and there should be three buses sitting waiting. One goes north to Cladach, Brodick Castle, Corrie, Sannox, Lochranza and round to Blackwaterfoot. Another goes straight over to Blackwaterfoot via the mountain road, and the other goes south to Lamlash, Whiting Bay, Kildonan, Kilmory, Lagg and round to Blackwaterfoot. If you miss the bus, or are on the early ferry, A.R.C. 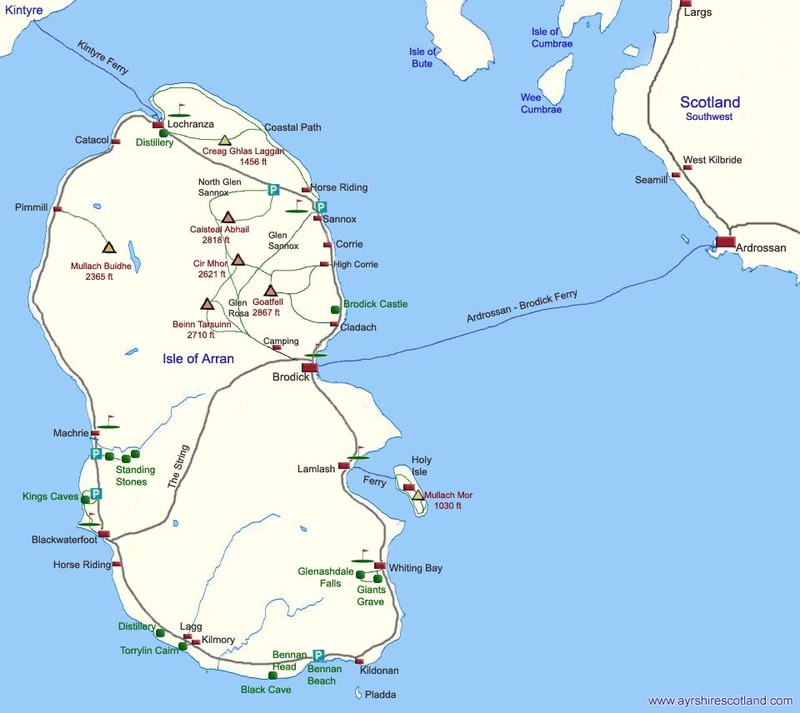 Private Hire are based in Brodick with a price guide for up to 4 people of about £16 between Brodick and Whiting Bay. Tel: 0777 608 2752. Lamlash based Taxi and mini bus hire call George on 07967 587 481. The image below is from the car park at Ashdale Bridge on the south side of Whiting Bay, about 8 miles south of Brodick. There is a bus stop right next to the Ashdale Bridge car park as seen below. The start of the walk to the Glenashdale Falls and Giants Grave starts just over the bridge. There are walking signs pointing up a narrow lane. The narrow lane is a few hundred yards long and passes a few cottages. You then reach the end of the lane where a well marked woodland path leads to the Glenashdale Falls. The image below is of an information board at the start of the trail to the Glenashdale Falls. The falls are the route straight up, as seen on the map, and the Giants Grave is round and back down to the left. The route round to the right leads to an ancient fort and back down through Whiting Bay. The image below is where the narrow road ends and the woodland path begins. There are more information signs here. The image below is from the steeper last part of the woodland path to the Glenashdale Falls. The image below is the viewing platform for the Glenashdale Falls. The image below is of the top section of the Glenashdale Falls. Had only seen pictures of this section before so was surprised the falls are a lot higher, going right down into the glen. Seems nobody can get all the falls in the one pic, so I joined two pics together to show them all, as seen on the link below. The falls are said to be even more impressive after heavy rain. Large Image of the Glenashdale Falls. The image below is of the trail just above the Glenashdale Falls. The road to the right leads to an ancient fort and down into Whiting Bay. The road to the left leads to the Giants Grave and back down onto the Glenashdale Falls trail close to Whiting Bay. The image below is of the road round to the Giants Grave. This path is fairly level with good views to the left over Whiting Bay and the Holy Isle. The image below is of the Giants Grave looking north with the Holy Isle in the Distance. This site is said to be early Bronze Age graves with a central chamber. There were trees planted all around the graves for many years. These trees have recently been cut down, allowing fantastic views all around. Hopefully they will not plant trees as close in the future. Think the reason it is named the Giants Grave, is people believed it was the grave of one person, rather than the grave of a number of people, so must have been a really large person. The image below is from the trail leading back down into Whiting Bay. You can see the Ashdale Burn, Ashdale Bridge, and car park down to the right in this image. This has to be the best place to view Whiting Bay. The image below is of winding road down from the Giants Grave to the Glenashdale Falls Trail, a few hundred yards up from the Ashdale Bridge car park. The image below is of the Ashdale Bridge south side with a boat full of flowers. The walk to the Glenashdale Falls is steady uphill most of the way with a fairly steep section just before the falls. The walk round from the falls to the Giants Grave is fairly level with great views. Not sure what the fort is like on the other route. It was back in the car after this walk and down to the Torrylin Cairn at Kilmory on the southwest of the island, that is similar to the Giants Grave, but only half of a mile, fairly level, walk out to it.